One of the things that has been notorious after studying this epistle, is how many times Paul addresses the importance of self-control. The elders must exercise it (1:8), as well as the older men (2:2), the older women (2:3), the younger women (2:5), and the young men (2:6). This makes me think that one of the character traits that should define us as Christians should be “self-control.” But how much we fail to be self-controlled. How much I need the Spirit of God to help me in this area! The truth is that maybe we know not what “agonizing” over our sins and temptations is like; most of the times we just let them remain in a secret corner, somewhere in the depths of our heart. We let them stay… a little bit longer. Why not? This is great Becky. 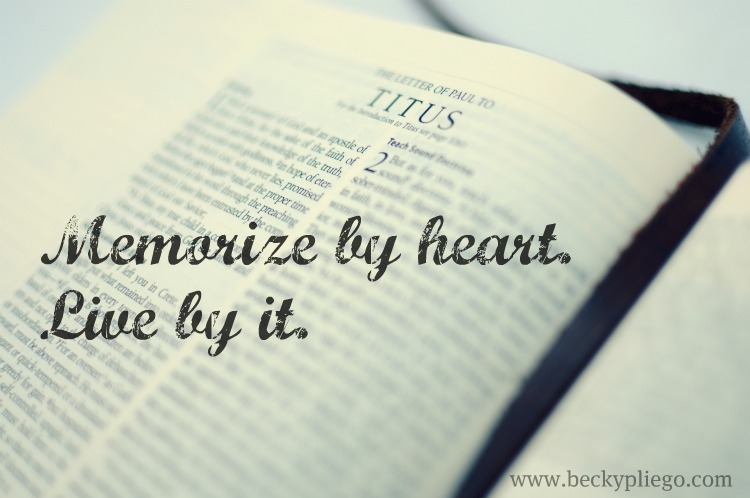 That little book of Titus contains so much instruction for us! How true it is that we cannot exist in the faith apart from community — it is the primary means whereby His grace flows. Living in community makes un accountable. Thank you for sharing this!